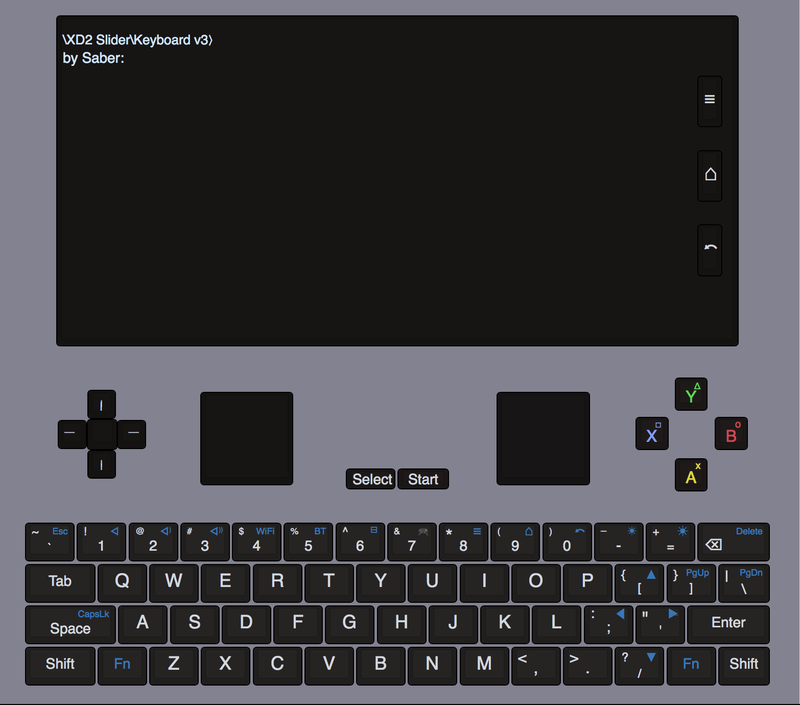 After noticing that slider concept for the XD2(which intrigues me more than the Win 2), I thought of how a basic minimal physical keyboard could be added. I asked GPD (on Facebook) and they said the have no interest in visiting the slider design. hopefully this changes, we will have to see. I wouldn't get my hopes up though. Whether they ever release an XD2 and whether or not they use the slider design, I don't know if they would consider putting in a keyboard. I would LOVE for them to put in a keyboard, rather than shoving a blank space in our faces again, but they didn't seem too keen on doing it before. The slider concept must of been too complicated for them to make(and one of the reasons there aren't many/any on the market by anyone else). Maybe another day. Maybe too many moving parts to consider? I think the keyboard addition will only make the price go up, after all, GPD xd's sole purpose is gaming... frankly, if they increase the screen size to 6 inches, add clickable sticks and use a more powerful SOC, things will be better. many reviewers stated performance wise XD+ is not that much of an upgrade. they can look for SOC like SD 660,821 or the new MTK line-up to pack a punch, as PS2 emulation is now getting done on android. Qualcomm is pretty dickish to smaller companies and products they don't see as viable for their SoCs, so I really don't think we'll ever see a Snapdragon in an XD-type device. Maybe, but it could be that DS clone clamshells are the only accepted adopted style in this niche presently. I've always wanted a pocketable tablet with a screen that slides to reveal a physical keyboard, so I don't have to rely on screen tapping input, and then slides a bit more showing some "hidden" game controls. Any news on the the XD 2? GPD has been pretty quiet with any updates. Well thats pretty crappy news. Are they just concentrating on the WIN now? Thats really unfortunate if the XD+ is the last good android handheld, I liked that it is fairly affordable cmpared to the WIN 2 . Xd+ was not good. It has a screen refresh bug issue that makes accurate emulation for retrogaming worse than old XD. Only some emus like PPSSPP are slightly better than old Xd. Yes it is disappointing that GPD did nothing to fix the issues with XD+. Hoping Black Seraph will continue to work on this device in the future. The problem is that nobody know how to fix it. In kernel the screen is ok, so it must be a mtk SDK issue or something else. I suggested a couple of things but nobody compiled it I think. And I got retired so.... maybe Black Seraph do something in the future but I don't know. I can understand GPD decide to go to windows devices, because they have been more profitable to them than android ones. XD was a good success, xd+ a big fail in sales as far as I know. I think xd+ would of sold better if they supported it more. On so many forums I read people asking about it and most of the feedback was stick to original XD due to the issues with XD+. The market is there but they kinda screwed themselves doing half a job. It's a shame they could not get a top end Snapdragon or even Hauwei chip in it though would of avoided these issues plus given it a longer shelf life and increased sales. I got the original GPD Win but sold it after a month and don't want to go that way in the future. I hope if GPD don't come back with a killer android device someone else will. A high end snapdragon would be twice the price. I guess they decided MTK for that reason. Also, Qualcomm only sells in big quantities, something GPD cannot do. I personally prefer win devices. They are more expensive but emulation experience and Pc games is an incredibly plus. Yeah I understand the reason for MTK and Snapdragon was not feasible but its a pity as the device feels short changed. It was just a revision because they could no longer get Rockchip chips, probably people thought of xd+ as a XD2 and it was the big mistake. I personally for retrogaming prefer old Xd over xd+ in spite of being android 4.4. at least refresh rate and vsync is perfect for 8/16 bits and FBA. xd+ has the advantage of ppsspp a bit better and some games not supported by android 4.4, but android game catalogue is so poor that is not a big lost xD. Just leaving this here FYI, the refresh bug was fixed in Black-Seraph CleanROM 2.0 which you can download now by becoming a patreon on his patreon page or just wait till February 1 for public release. Also the refresh bug apparently had nothing to do with refresh rate, more details here. Well, it's related to HPS driver, but always was called refresh bug because it affected the screen refresh rate, though the screen rate wasn't the culprit at the beginning. The very first firmware od xd+ had a Screen Refresh rate of 56,7 hz. After that LCD timings were chamged to current 59.97hz, but that wasn't enough. But anyhow, the refresh rate bug is a good name because in the end it was the main issue affected that made emulation not buttery smooth. Even so, after retesting an old XD I notice old XD even a little bit better in that sense, though that is something that 99.9 percent of people won't notice.